Looking for a hiking group? Start your own. My hiking group has been hiking together for more than 15 years. During that time, of course, many people have come and gone, but the original two are still part of the gang–my husband Don and me. In the picture, nine of us are at the top of Maple Pass; the photographer, Jon O., set the camera and ran into the top row. Hiking with these people, we were very limited in our destinations. Don and I knew that, living in Seattle, with two national parks and the Cascade mountain range only an hour or two away from home, there would be lots of great opportunities if only we drove a little further or stayed out a little later. Neither of us liked to come home tired after a hike to face the prospect of cooking dinner; stopping for dinner at a restaurant on the way home would give us a chance to relax and rest after the hike, and come home happier. We made an announcement: from now on, no rushing home early for evening events. We would go farther, stay out longer, and stop for dinner on the way home. My friends accepted these new conditions! At first they prepared dinner for their husbands before they left home, but they soon stopped. They discovered that these gentlemen were ignoring the dinner in the fridge and going out for pizza or burgers. So for several years there were five of us, Don and me in the front seat, and three ladies squeezed in the back. As time passed and we grew older, we were joined by some retired men, whose wives also appreciated their night out, and by several retired couples, newly arrived in town. Now we often have three carloads, instead of one. I have 33 names on my email list of people interested in knowing about our hikes. Not all of them hike–some are members of other hiking groups, with whom we share information. I send out a notice on the weekend of where our next hike will be and where we will meet. People respond by email to let us know who is coming. Our hikers carry their lunches of course, and also water, hats, extra warm clothing and rain gear, and we all have good boots and walking sticks. Some also carry first aid kits, maps, sit-upons and phones. We usually have between 8 and 12 on a hike, but sometimes as many as 18. The median age of our group is probably 75. In fall, winter and spring we go on urban hikes (one man calls them “urbane”), stopping for lunch at a nice cafe or restaurant. In summer, we head for the mountains. We used to set our limits at 8 miles round trip with 2000 feet of elevation gain. Now we go no more than 6 miles, with up to 1000 feet of gain. I like to explore new territory so I am always on the alert for hiking information from park departments in cities and counties surrounding Seattle. I subscribe to Washington Trails, an excellent organization with a magazine and website full of suggested hikes, and I trade destinations with other hiking groups. Several of the people in our group are also good planners, especially for the urban hikes, so we are never short of destinations. We have only one problem: as we have aged, many of our members no longer feel up to driving an hour or more to the trailhead. We are recruiting younger members who are willing to drive. We’re like that commercial: “Drivers wanted.” I have had to turn down people who wanted to join us, because there is no more room in our cars. So if you are looking for a hiking group, pick one other person, decide who will drive, and go have fun! The others will find you. 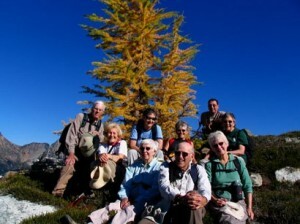 This entry was posted in Camping and Hiking Equipment, Camping and Hiking Tips, Hiking, On Aging, Urban Hiking, Winter Camping and Hiking and tagged Golden Agers, Golden Larches, Washington Trails. Bookmark the permalink. 3 Responses to Looking for a hiking group? Start your own. I interviewed you a few years ago for Parents Talk Radio in Canada. I am now writing a column called Momsense for a national magazine and was wondering if I could send you a few email questions and mention your book? Sorry, Andrea, I remember your podcast, and I would be happy to answer your questions. I am embarrassed that it’s taken more than a year to get back to you, and if you do send me questions, I’ll get back to you much faster. (And if you’re angry and don’t respond, I understand. Hi Goldie! We are in the process of starting our own group and wondered if I might pick your brain a bit. Shoot me an email when time permits.